An easy way to picture your theme or color scheme is to identify a focal point of interest. You want the guests to be drawn to your idea or subject. When deciding on a floral centerpiece or any arrangement decide the ‘WHY‘. 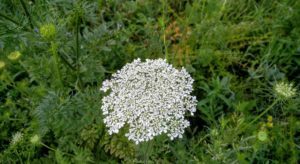 Many times it is not just the flower as the focal point; however, what is surrounding the object that engages the audience.I noticed the Queen Anne’s Lace Daucus carotar flower while walking one morning and see it was surrounded with various shades of green and a ‘pop’ of color in the background. 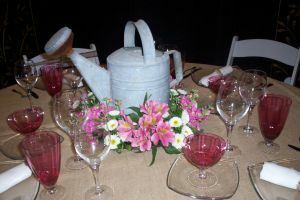 This is a basic creative and color coordination tip that can be used at dinner parties when setting up the guests tables. Be creative with your colors and have fun with the background that surrounds the basic color. You can add splashes of color in the napkins, plates, glasses, flatware or even a table runner. Just think of a corporate dinner party and imagine the speakers presenting with the backdrop of the corporate logo/symbol, curtain lights or to soften the ambience silence the room with earth tones or soft up lightning. It times to create and look beyond the obvious – ENJOY!! !